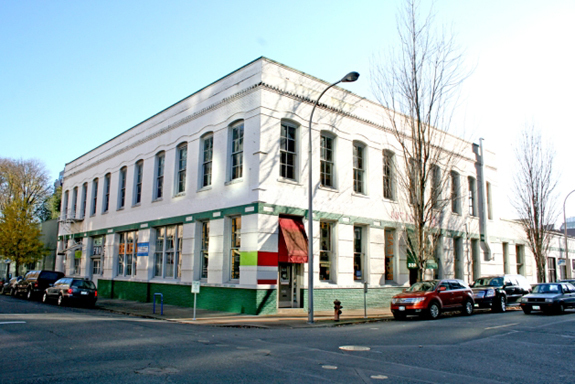 The 20,000 square foot, two-story building was located in the Pearl District at the corner of NW 9th Avenue and NW Flanders Street. Commercial tenants occupied a portion of the 1st floor and the vacant 10,000 sq. ft. 2nd floor was renovated for the filming of the series. An additional 7,000 sq. ft. was used in the building for production. The Production Designer who created the interior design of the Loft was Katherine De Luca and the Set Decorator was Rick Gonzalez. A six month lease was signed between Bunim-Murray Productions and the property owner. Prior to the filming of the series, the property was listed for sale at $3.25 million. On 9/5/2013, it was announced that The Raymond Group paid $3.125 million for the 18,000 sq. ft. building and an adjoining lot. The building has since been demolished and a new 8-story, 243 room Hampton Inn & Suites with ground floor retail now sits on the site.